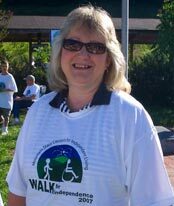 Photo description: The photo of Susan Weinberger, MTSTCIL board chair, was taken at the Walk for Independence 2007. Susan is wearing the official Walk t-shirt. Ms. Weinberger has been a member of the Mountain State Centers for Independent Living board since 2000 and served as board chair from 2003 through 2010. Ms. Weinberger brings over thirty years experience working in the disability community to the Mountain State Centers' board and is currently employed by the WV Division of Rehabilitation Services (WVDRS) as supervisor of the Transistion and Education Programs. Through her work with WVDRS, Susan experiences a deep sense of satisfaction and the opportunity to live an authentic life and to "leave the world a better place than she found it". Early in her career as an independent living rehabilitation counselor, Susan would go into the homes of people with disabilities, conduct assessments of their daily activities and work with clients to identify solutions or adaptive equipment to accommodate their needs. She would follow through to deliver and install the equipment, train clients on use and evaluate their progress. It was through this work that she was first introduced to the Centers. Susan continues to use Mountain State Centers for Independent Living as a referral source and a resource for her work and for her clients. For many years she has worked together with MTSTCIL identifying the needs of individuals with disabilities and the latest technology to accommodate those needs. Whether it was skills classes, adaptive equipment, advocacy or transportation, Susan found the staff of MTSTCIL was always willing to go the extra mile to help someone be more independent. During her time serving on the board Susan has been involved with the purchase of their current building in Huntington, paying the building loan, installing a new elevator in the building as well as community outreach such as developing the annual "Walk for Independence"; the participation and planning for the "Walk n' Roll" Disability Awareness Parade; City Of Huntington surveys on curb cuts and sidewalk repairs; and many other expansion and relationship developing projects in the community.